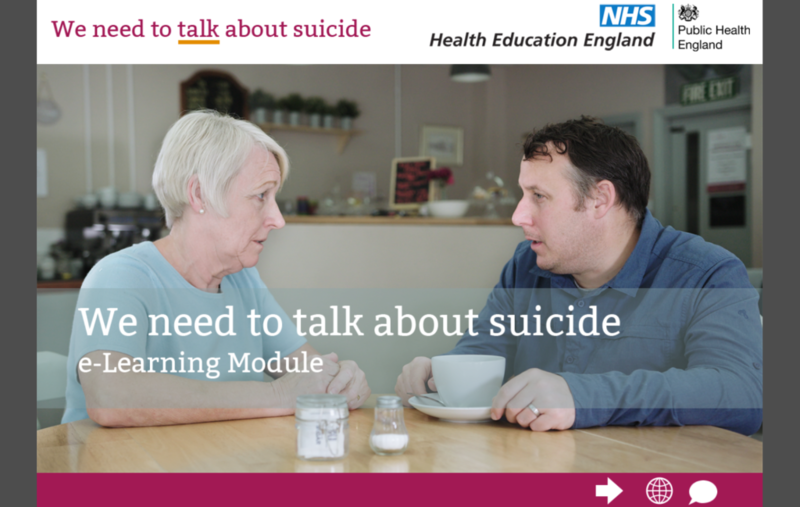 ‘We need to talk about suicide: helping everyone to feel more confident to talk about suicide’ is an eLearning programme that has been developed for the wider public health workforce including voluntary sector, blue light services, prison staff and prison listeners health and social care. It was developed by a range of experts including experts by experience i.e. those people who have attempted to take their own lives and those bereaved and affected by suicide. The programme is based on four storylines of people who are at increased risk of dying by suicide. During these four 4 video scenarios the learner will have the opportunity to reflect on their learning. The learner will be able to complete the entire programme at once or complete at their own pace in smaller sections. How can I access the eLearning programme? If you log-in to your account or register for an account on the e-LfH Hub, a record of your learning and activity in the package will be saved. If you don’t have an account you can still play the package but no record of your achievement will be saved. 000 Suicide Prevention – We need to talk about Suicide. The appropriate person would need to have set up a login on the e-LfH Hub in order to be able to access and run compliance reports. The organisation must ensure that the eLearning accounts for their staff on the e-LfH Hub are set up using their work email address.